Some years ago, and when approaching a significant period of change in my life, I used to walk regularly in one of my favourite nature places, the small Surrey village of Hambledon. The place gave me peace and tranquillity at a time when there was none; it provided a sort of bubble of other worldly reality that I could dip into as my regular world slowly and surely slipped away from me. I noticed, one very sunny morning, on a walk through the churchyard, a very old yew tree, broad in the beam and huge in overall stature. It seemed to beckon me as I stood below its branches gawping upwards; it felt quite alive and I felt safe to shimmy through the significant opening in its side and to experience even a feeling ofprotection as I peered around its inner-sanctum; the womb of this great and ancient being. Yew trees are often like this: as they grow over the centuries, they seem to very gradually split apart to reveal an interior in which one could almost feel is habitable. I really didn’t want to leave. The very next morning I passed the yew on a footpath across a farm and open fields.. I could see a man standing at a distant wooden gate who greeted me in a very-well-to-do English brogue: “have you seen the yew trees?” he said.. “if you look this way there is one on the hill, another across the field and one more in the churchyard, they form a triangle, you know.” I didn’t know, but thanked the man anyway and continued on my way. Strange, he said nothing more than that and then set off in the opposite direction, almost as if he had been waiting for me to come along to deliver his message. That same evening, I set off in the half-light on my usual route but, as I returned past the church I glimpsed what looked like a camera crew set up near to the Yew tree. Being of an inquisitive nature I climbed over the church wall to take a closer look and was warmly greeted by what turned out to be a film crew from the BBC who were making a weekly short-series on British trees. They told me that this yew was rather special and likely to be anything up to, or over, 3000 years old! I went home feeling quite excited and looking forward to seeing my tree on the small screen. The following morning – I walked twice a day at that time – I arrived at the car-park by the church, parked my motorcycle and, just as I was about to start my walk, a voice chimed out behind me “good morning, lovely day for it.” There was a man sitting on the back of his station-wagon slipping on his walking boots. “Yes, lovely day,” I replied, and we started chatting. I mentioned the film crew of the previous evening and the man, who lived quite a long distance away, was more than interested. “I have a book in my car about the yew tree in the churchyard.. here, take a look” I opened the pages and, sure enough, there was the tree, and with various notes and even legends surrounding it. One proclaimed ‘walk three times around the tree and you will see a witch’; Another that the tree remembers everything that happened around it over the years. It was fascinating! The tree in past times was a favourite place for children to play said the author. Having made my acquaintance with the Great Yew in Hambledon, it seemed only natural to invite friends to come and enjoy with me the magic of the churchyard and its apparent guardian.. and so I did. The first to accompany me was a very special female who had been in my employ and whom I much admired for her appreciation of nature and the protection thereof. She was not, as I would have perceived it at the time, a ‘spiritual’ lady and, as such, I would not normally broach the subject with her. I was, however, to be quite taken aback when the two of us approached the Yew: I suggested right away that we enter the tree by its breach-opening and… “Oh no” she cried, “we need to ask permission from the tree first”.. not spiritual, I thought..? We did ask, of course, and were duly rewarded: as we slipped through the gap; a large blackbird flapped its way by and hovered above us for several seconds. Might he have been there to guard the entrance? She loved the tree, and I loved it the more for that. Some weeks later, and under a lot of pressure from my then business, I escaped the material world once again and headed for the church in the company of my motor-bicycle. As I parked up under an old Oak, I noticed I was not alone: a lovely old Italian bike was leaning jauntily against the cemetery wall.. I recognised it immediately as being owned by an old friend. I could already distantly see him walking in the corn-field beyond the churchyard. I called, he was startled, and very surprised to see me! This fellow rider had also worked for me some years ago and we had formed a wonderful friendship. We have shared two things in common: Motorcycling and years of suffering M.E. Of course, I couldn’t wait to show him my tree and beckoned him to follow me through the gate and toward the Yew. He immediately clambered onto the tree, climbing high on its stout branches. Looking up I said “see the branch below you? It has a weird growth which looks like an ugly woman wearing a hat.” But he couldn’t see it, so I began to climb the tree. Then it happened: as I reached to grab the branch in question I was ‘blown’ off the tree. Yes, blown! I felt a strong wind literally push me away from the tree. As I fell, I envisioned landing on one of the gravestones below; how I missed them I will never know. Luckily for me I ended up landing in a heap but on softish soil. We both laughed, nervously, he descended from the tree, we walked, we left. I thought nothing more about it. Two weeks later I became very, very ill with severe M.E. symptoms..so bad that I went to visit a Healer I knew who lived in a nearby village. She had helped me before and I really trusted her and her healing hands. When I arrived, she took me to her sanctuary, sat me down, held both my hands and said “you are covered in a sort of ‘glue-like’ energy.. where have you been, where have you been walking lately.. you haven’t been in any old churchyards have you?” Well, what could I say? “I have been at the old Yew in Hambledon” I replied..she looked at me, knowingly; “you’ve picked up a very old energy there and its become stuck around you” She then laid me on her bench and brushed her healing hands over me.. “you’ll be fine now” she said. And I was! About a month later I phoned my fellow tree-climber for a chat, and to my utter amazement, I learned that he too had become severely ill, also with M.E., during the same period. I wouldn’t normally speak in these terms with this particular friend, but I asked him if he thought it may have anything to do with the tree? He, of course, pooh poohed the idea but in the same breath related that he had met a young woman with a baby who had been sheltering under the tree one day when she was suddenly filled with dread; she fled, with baby and buggy, as far away as she could. “So your becoming ill had nothing to do with the tree then?” I said. There followed a long silence. We both lived happily ever after, of course, but it just shows that trees are maybe not unlike us in some ways and so we need to be treat them as we would (or should) one-another. If you honour the spirit of the tree it befriends; if you disrespectfully jump upon it, it reacts, just as an animal or many humans would do in order to protect themselves. Pure logic, or spiritual common-sense methinks! I have heard other stories about ‘mischievous’ trees etc., but I don’t let it take me into fear: if you don’t understand something it doesn’t mean you need to fear it. That little episode was over 20 years ago and I have learned since that trees have feelings, memories too, if you like, and they respond to love. 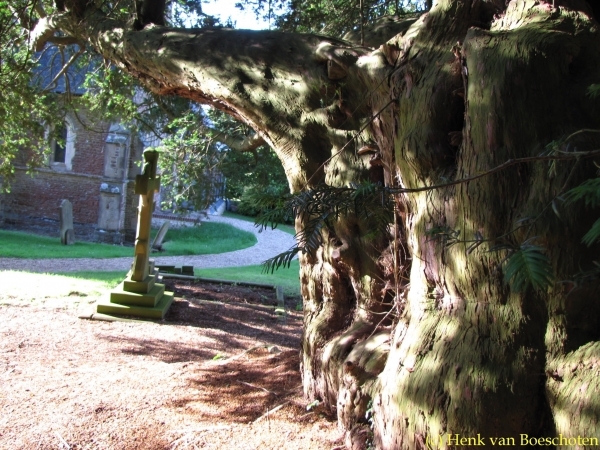 The warmth you can feel and the protection offered from the Ancient Yew is like no other. It is sacred. It is beautiful. The pagans, The Druids and the ancient ones knew it.